Dubai offers a host of adventure activities for people of all ages to indulge into. So if you are planning for an adventure trip with friends, family or staff, there is no better way to get over your mundane schedule than to indulge into some adventure that has varying degree of fun quotient. 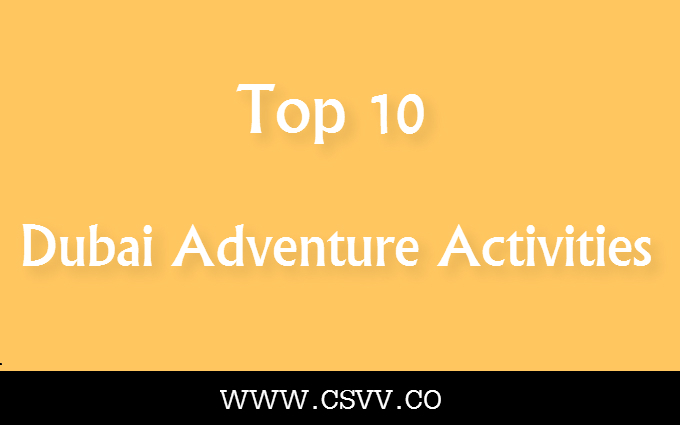 Here we list the top 10 Dubai adventure activities for people of all ages. You have heard us just right! If you are aware of this adventure that of a helipad ride, which offers a whisking and tantalizing gallop to witness the famous landscapes of the place, you have just made your journey count. Is there a better adventure than seeing the world’s largest skyscraper almost eye-to-eye? The aerial view of the magnificent town with some world-famous islands, creeks, landscapes and monuments is something to be cherished and to talk about for ages to come. One of the best activities to drive your adrenaline and challenge you on a bashing desert terrain is a ‘hummer desert safari in Dubai’. The safari highlights the true characteristics and charm of Dubai that very conventionally portrays its rich heritage. A hummer desert safari is a guided tour that takes you and your group on a gusty ride over the desert dunes. There is more fun to complement your tour if you add quad biking, sand boarding or a camel ride that may happen at your discretion once you are off your SUV. The hammer halts a various interesting locations to get a peek of the splendid surrounding which is coordinated with sun set. Clicking pictures is another activity you may indulge into during these halts with your clan. If you look up with respect towards the ‘ship of the desert’ or have kids who are fascinated about animals, a visit to a camel farm can bring extra oodles of fun. The hummer safari just does not end here. Post sunset while you are in the midst of the cool desert terrain, you are in for more surprises. The most delectable spread of traditional Arabian cuisine is waiting to be savored, besides there is fire, belly dancing, beverages to wind up the day in royal traditional style. Indulging in mehendi designs or clicking pictures with you wearing traditional Arabian attire are other fun add-ons of the night. A vacation that combines a desert safari as well as snow mountain skiing sounds obnoxious. However, only Dubai offers you this feat to indulge in these adventure activities that are as different as chalk and cheese. Indoor skiing is one of the most sought after adventures that most people indulge into. Ski Dubai and the Mall of Emirates are renowned locates that offer indoor skiing apart from other addenda’s such as food courts, shops and department stores. Nevertheless indoor skiing tops it all for its unique notion and the set up and feel it brings to your vacation. Ski Dubai features a 60 meter high mountain and is backed with 5 slopes to give seasonal skiers a run for their money. It also features a snow park for some looking to just have fun making snowman, sledding or tobogganing. An opportunity to enjoy and play in real snow all throughout the year is something unimaginable in a desert nation. Just imagine the fun proportion while you vacation in Dubai. If you have the time and inclination to rise your adventure that equals your excitement, hot air balloon ride can add that extra zing to your trip. The fun and thrill is altogether different while you are hundreds of feet in air getting a view of the delightful Dubai. With some of the most world-famous and unique architecture, splendid beaches, Islands, and communities formed from excavations, you are simple game to witness one of the best views on this joy ride. Many places in Dubai offer this one of a kind thrill of taking a hot air balloon trip. Besides, you are well guarded with all the requirements and guidelines for a safer ride. Beaches comes as one of the best attractions for its beauty and element of fun. Dubai with a rich coastline has innumerable renowned beaches that are popular for its clear waters, glittering white sand and serene environment. The Al Mamzar Beach is a sheltered one, and thereby safe from the currents. You will find fishes close to the shore in its crystal clear water. Besides it offers some fun activities such as snorkeling and net volley ball on the shore. The calm waters of Dubai are best suited for kayaking and paddle boarding. There are a lot of other fun activities to get indulged into on the innumerable beaches that offers varied sports for kids based on their age group. Deserts and Water Parks may be miles apart, but Dubai has it all. The numerous Water Parks and Theme Parks in Dubai clearly highlights it’s splendor. It has in many ways enticed people from various continents to this desert nation. One of its attractions is the Wild Wadi Water Park. Located at Jumeirah Beach Hotel, the park offers a variety of rides, water slides and surfing opportunities. With a play area for children its greatest thrill is free-fall slide that is noted to be the tallest and fastest slides only next to the slides in North America. If your quest for water sports does not end here, do not fret. Theme parks such and Wonderland and Splashland say it all to drench in the excitement of water sports. Moreover you may indulge into the many varieties of food found in the numerous fast food restaurants, all under one roof. A picnic or camp in the desert dunes is also an exciting endeavor, especially if you have friends for company or your little ones to spend a night on the desert terrain. If you have planned such a picnic all by your own, then ensure you have all the necessary things and that you are also guarded with supplies to survive the night. Blankets, tents, wood for fire, food, beverage and goodies can make it a memorable event to be cherished for years to come. Kids have their hands full with the numerous activities they can indulge into in Dubai. Right from riding a pony to feeding fishes or trying their hands on a scooter ride on a beach, it’s fun unlimited for the restless beings. Taking a ferry trip is another fun activity for the whole family. It is a treat to watch the city from the sea with a splash of fresh air. Malls in Dubai constitute the major highlight of the city for the enormous amount of fun and excitement one can indulge into. The Dubai mall for instance offers innumerable stores, food counts, multiplexes, candy shops, theme parks, ice rink, fashion catwalk, aquarium, waterfront Atrium, gold souk, oasis fountain waterfall to name a few. With so much on your plate to indulge into one can hardly get the most out of Dubai in one visit. A spectacular piece of art and free entertainment are the Dubai Fountains that illuminates with dignity each evening dancing to well-choreographed tunes of Arab, Classical and World music. The fountain that lights up the Burj Khalifa lake is 886-feet long, which shoots the dancing waters to a height of 500 feet, and is illuminated by 6,600 super-lights. This fountain is one of the biggest attractions of the Middle-East. Least to say that its radiance is visible even from outer-space. To enhance your entertainment quotient, you may enjoy this spectacular show from a lakeside restaurant while you enjoy a quite meal or a beverage eloped in the glory of the music, lights and its serenity. Adventure lovers across the globe should thank themselves for visiting one of the best destinations which oozes with adventure in many forms. Dubai is definitely one of them and given the numerous adventure activities you can indulge into, Dubai in the near future can definitely make it to be called as a second home for adventure lovers!